Illustration from the Jade Record: Tortures being meted out in the Sixth Court of Hell: hammering metal spikes into the body; skinning alive; sawing body in half; kneeling on metal filings. According to ideas from Taoism, Buddhism and traditional Chinese folk religion, Diyu is a purgatory that serves to punish and renew spirits in preparation for reincarnation. Many deities, whose names and purposes are the subject of conflicting accounts, are associated with Diyu. Some early Chinese societies speak of people going to Mount Tai, Jiuyuan, Jiuquan or Fengdu after death. At present, Fengdu and the temples on Mount Tai have been rebuilt into tourist attractions, incorporating artistic depictions of hell and the afterlife. Some Chinese folk religion planchette writings, such as the Taiwanese novel Journeys to the Under-World, say that new hells with new punishments are created as the world changes and that there is a City of Innocent Deaths (Chinese: 枉死城; pinyin: Wǎng Sǐ Chéng) designed to house those who died with grievances that have yet to be redressed. Ming dynasty (16th century) glazed earthenware figurines representing three of the ten Yama Kings. Entrance to the "Ten Courts of Hell" attraction in Haw Par Villa, Singapore. The Ox-Headed (right) and Horse-Faced (left) Hell Guards stand guard at the entrance. The concept of the "Ten Courts of the hell" (Chinese: 十殿閻羅; pinyin: Shídiàn Yánluó) began after Chinese folk religion was influenced by Buddhism. In Chinese mythology, the Jade Emperor put Yama in charge of overseeing the affairs of Diyu. There are 12,800 hells located under the earth – eight dark hells, eight cold hells and 84,000 miscellaneous hells located at the edge of the universe. All will go to Diyu after death but the period of time one spends in Diyu is not indefinite – it depends on the severity of the sins one committed. After receiving due punishment, one will eventually be sent for reincarnation. In the meantime, souls pass from stage to stage at Yama's decision. Yama also reduced the number of hells to ten. He divided Diyu into ten courts, each overseen by a "Yama King", while he remained as the sovereign ruler of Diyu. Among the various other geographic features believed of Diyu, the capital city has been thought to be named Youdu. It is generally conceived as being similar to a typical Chinese capital city, such as Chang'an, but surrounded with and pervaded with darkness. The headless ghost of Yue Fei confronting the recently deceased spirit of Qin Hui in the Sixth Court. The plaque held by the attendant on the left reads: "Qin Hui's ten wicked crimes." 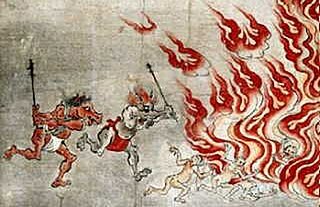 From a 19th-century Chinese Hell Scroll. Mountain of Knives: Sinners are thrown off cliffs and land on mountainous terrain with sharp blades sticking out. Some depictions show offenders climbing trees with knives or sharp thorns sticking out of trunks and branches. Cauldron torture: Sinners are fried in cauldrons of oil. Dismemberment: Sinners are dismembered by various means, including sawing, slicing into half, mashing/pounding into pulp, being crushed by rocks/boulders, being run over by vehicles, etc. Grinding torture: Sinners are put into a grinding machine and ground into a bloody pulp. Burning: Sinners are set aflame or cast into infernos. Paolao torture: Sinners are stripped naked and tied to a large hollow metal cylinder with a fire lit at its base. Boiling liquid torture: Boiling liquids are forced down sinners' throats or poured on parts of their bodies. Tortures involving removal of body parts or organs: Tongue ripping, eye gouging, teeth extraction, heart digging, disembowelment, skinning, etc. Ice World: Sinners are frozen in ice. Some depictions show unclothed sinners suffering frostbite in an icy world. Their bodies eventually fall apart or break into pieces. Scales and hooks torture: Sinners are pierced with hooks and hung upside-down. Some depictions show sinners having nails hammered into their bodies. Pool of Blood: Sinners are cast into a pool of filthy blood, where they drown. Blood spills from all bodily orifices. Tortures involving animals: Sinners are trampled by cattle, gored by animals with horns or tusks, mauled or eaten by predators, stung or bitten by poisonous species, etc. Avīci: The period of suffering in this chamber is the longest. It is reserved for sinners who have committed heinous crimes, including the Five Grave Offences. Some literature refers to eighteen types of hells or to eighteen hells for each type of punishment. Some religious or literature books say that wrongdoers who were not punished when they were alive are punished in the hells after death. Difu (Chinese: 地府; pinyin: Dìfǔ; Wade–Giles: Ti4-fu3), "Earth Mansion". Huangquan (simplified Chinese: 黄泉; traditional Chinese: 黃泉; pinyin: Huángquán; Wade–Giles: Huang2-ch'üan2), "Yellow Springs", called yomi in Japanese. Yinjian (simplified Chinese: 阴间; traditional Chinese: 陰間; pinyin: Yīnjiān; Wade–Giles: Yin1-chien1; literally: 'Yin dimension'), "Land of Shade". Yinfu (simplified Chinese: 阴府; traditional Chinese: 陰府; pinyin: Yīnfǔ; Wade–Giles: Yin1-fu3), "Shady Mansion". Yinsi (simplified Chinese: 阴司; traditional Chinese: 陰司; pinyin: Yīnsī; Wade–Giles: Yin1-szu1), "Shady Office". Senluo Dian (simplified Chinese: 森罗殿; traditional Chinese: 森羅殿; pinyin: Sēnluódiàn; Wade–Giles: Sen1-lo2 Tien4), "Court of Senluo". Yanluo Dian (simplified Chinese: 阎罗殿; traditional Chinese: 閻羅殿; pinyin: Yánluódiàn; Wade–Giles: Yan2-lo2 Tien4), "Court of Yanluo". Jiuquan (Chinese: 九泉; pinyin: Jiǔquán; Wade–Giles: Chiu3-ch'üan2), "Nine Springs". Zhongquan (Chinese: 重泉; pinyin: Zhòngquán; Wade–Giles: Chung4-ch'üan2), "Heavy Spring". Quanlu (Chinese: 泉路; pinyin: Quánlù; Wade–Giles: Ch'üan2-lu4), "Road to the Spring". Youming (Chinese: 幽冥; pinyin: Yōumíng; Wade–Giles: Yu1-ming2), "Serene Darkness". Yourang (Chinese: 幽壤; pinyin: Yōurǎng; Wade–Giles: Yu1-jang3), "Serene Land". Huokang (Chinese: 火炕; pinyin: Huǒkàng; Wade–Giles: Huo3-kang4), "Fire Pit". Jiuyou (Chinese: 九幽; pinyin: Jiǔyōu; Wade–Giles: Chiu3-yu1), "Nine Serenities". Jiuyuan (Chinese: 九原; pinyin: Jiǔyuán; Wade–Giles: Chiu3-yüan2), "Nine Origins". Mingfu (Chinese: 冥府; pinyin: Míngfǔ; Wade–Giles: Ming2-fu3), "Dark Mansion". Mingjie (Chinese: 冥界; pinyin: Míngjiè; Wade–Giles: Ming2-chieh4), "Dark Realm", "Underworld". Kujing (Chinese: 苦境; pinyin: Kǔjìng; Wade–Giles: K`u3-ching4), "Dire Straits", "(Place of) Grievance". Abi (Chinese: 阿鼻; pinyin: Ābí; Wade–Giles: A1-pi2), "Avīci", the hell of uninterrupted torture, last and deepest of the Eight Hot Narakas. Zugen (Chinese: 足跟; pinyin: Zúgēn; Wade–Giles: Tsu2-ken1), "Heel". Fengdu Cheng (simplified Chinese: 丰都城; traditional Chinese: 酆都城; pinyin: Fēngdū Chéng; Wade–Giles: Feng1-tu1 Ch'eng2), a reference to the Fengdu Ghost City. Naihe Qiao (simplified Chinese: 奈何桥; traditional Chinese: 奈何橋; pinyin: Nàihé Qiáo; Wade–Giles: Nai4-ho2 Ch'iao2), "Bridge of Helplessness", a bridge every soul has to cross before being reincarnated, they are said to drink the Mengpo soup(孟婆汤) at Naihe Qiao so they will forget everything in their current lives and prepare for reincarnation. Wang Xiang Tai (simplified Chinese: 望乡台; traditional Chinese: 望鄉臺; pinyin: Wàng Xiāng Tái; Wade–Giles: Wang4 Hsiang1 T'ai2), "Home-Viewing Pavilion", a pavilion every soul passes by on his/her journey to the Underworld. From there, they can see their families and loved ones in the world of the living. Youguo (simplified Chinese: 油锅; traditional Chinese: 油鍋; pinyin: Yóu Guō; Wade–Giles: Yu2-kuo1), "Oil Cauldron", one of the tortures in hell. Santu (simplified Chinese: 三涂; traditional Chinese: 三塗; pinyin: Sān Tú; Wade–Giles: San1-t'u2), the "Three Tortures": Fire Torture (simplified Chinese: 火涂; traditional Chinese: 火塗; pinyin: Huǒ Tú; Wade–Giles: Huo3-t'u2), Blade Torture (simplified Chinese: 刀涂; traditional Chinese: 刀塗; pinyin: Dāo Tú; Wade–Giles: Tao1-t'u2), Blood Torture (simplified Chinese: 血涂; traditional Chinese: 血塗; pinyin: Xuě Tú; Wade–Giles: Hsüeh3-t'u2; literally: 'spilling of blood'). ^ "诸经佛说地狱集要 [Collection of Buddhist Texts about Hell]". read.goodweb.cn/ (in Chinese). Archived from the original on 12 January 2014. Retrieved 8 January 2015. ^ 萧登福 [Xiao, Dengfu] (August 1988). "汉魏六朝佛教之"地狱"说（上） [Conceptions of "Hell" in the Han, Wei and Six Dynasties (Part 1)]". 东方杂志 [Eastern Magazine] (in Chinese). 22 (2): 34–40. Retrieved 8 January 2015. ^ 萧登福 [Xiao, Dengfu] (August 1988). 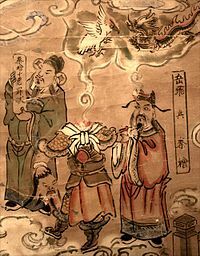 "汉魏六朝佛教之"地狱"说（下） [Conceptions of "Hell" in the Han, Wei and Six Dynasties (Part 2)]". 东方杂志 [Eastern Magazine] (in Chinese). 22 (3): 23–30. Retrieved 8 January 2015. ^ 印順法師 [Yinshun]. "華雨集第四冊 [Hua Yu Collection Volume 4]". www.yinshun.org.tw (in Chinese). Archived from the original on 12 July 2014. Retrieved 8 January 2015. ^ "泰山崇拜与东岳泰山神的形成 [Origins of the Worship of Mount Tai and the Deity of the Eastern Mountain Mount Tai]". www.taishanly.com (in Chinese). 3 March 2008. Archived from the original on 21 September 2013. Retrieved 8 January 2015. ^ "三. 枉死城亡魂戒改 [3. Rehabilitating the Souls of the Dead in the City of Innocent Deaths]". tienton.myweb.hinet.net (in Chinese). Retrieved 8 January 2015. ^ Xue, Fucheng. Yong'an Biji (Notebook of Yong An). ^ "瀕死經驗（六則）" [Near-death Experience (Six Parts)]. 佛教淨土宗.net/%E5%9B%A0%E6%9E%9C%E6%84%9F%E6%87%89%E4%BA%8B%E8%B9%9F/%E7%9B%AE%E9%8C%84.aspx (in Chinese). Archived from the original on 3 March 2016. Retrieved 8 January 2015. ^ "敦煌文献中的《还魂记》写本 [Manuscript of Huan Hun Ji among the Dunhuang Manuscripts]". The Grottoes of Dunhuang Information Network (in Chinese). Retrieved 8 January 2015. ^ 潘重規 [Pan, Chonggui] (1994). "九、唐太宗入冥記 [Volume 6: Chapter 9: Emperor Taizong of Tang's Journey to the Underworld]". 敦煌變文集新書 [Dunhuang Bian Wenji Xinshu] (in Chinese). China: 文津出版社 [Wen Jin Publishing House]. Retrieved 8 January 2015. ^ 黎澍 [Li, Shu] (March 2006). 慧淨法師 [Huijing], ed. 地獄見聞錄 [Records of Observations of Hell] (in Chinese) (3rd ed.). Taipei: 淨土宗文教基金會 [Pure Land Sect Foundation]. Retrieved 8 January 2015. 18層地獄：看看你會進幾層 (18 Levels of Hell: See which level you will end up in). xinhuanet.com (in Chinese). 12 July 2005. Retrieved 8 January 2015. The Guanghua Temple, also known as the South Mountain Guanghua Temple (南山广寺), is a Buddhist temple located at the foot of Mount Phoenix (凤凰山), about 2 kilometres (1.2 mi) south of Putian City, Fujian Province, People's Republic of China. Hell money is a form of joss paper printed to resemble legal tender bank notes.The notes are not an official form of recognized currency or legal tender since their sole intended purpose is to be offered as burnt offerings to the deceased as a superstitious solution to resolve their ancestors’ financial problems. This custom has been practiced by the modern Chinese and across East Asia since the late 19th century. Early 20th century examples bore resemblance to minor commercial currency of the type issued by businesses across China until the mid-1940s. In East Asian and Buddhist mythology, Yama is a dharmapala said to judge the dead and preside over the Narakas and the cycle of afterlife saṃsāra. Naraka (Sanskrit: नरक; Pali: निरय Niraya) is a term in Buddhist cosmology usually referred to in English as "hell" (or "hell realm") or "purgatory". The Narakas of Buddhism are closely related to diyu, the hell in Chinese mythology. A Naraka differs from the hell of Christianity in two respects: firstly, beings are not sent to Naraka as the result of a divine judgment or punishment; and secondly, the length of a being's stay in a Naraka is not eternal, though it is usually incomprehensibly long, from hundreds of millions to sextillions (1021) of years. Journeys to The Under-World, also known as Voyages to Hell, is a Taiwanese novel describing what Yangsheng (楊生), a planchette handler, saw and heard when he followed his master Ji Gong to hell on the instruction of the Jade Emperor. The story is about the consequences resulting from actions during the life of a person. It contains journeys made by Ji Gong and Yangsheng to each level in hell to warn those in the living world with an evil heart. Each chapter contains detailed descriptions of their observations and interviews with souls being punished in hell. 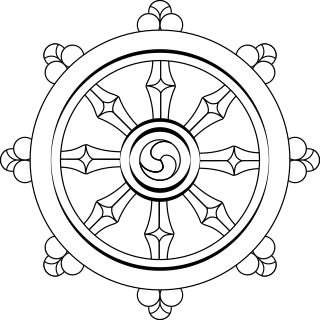 In Buddhism, Avīci or Avichi is the lowest level of the Naraka or "hell" realm, with the most suffering, into which the dead who have committed grave misdeeds may be reborn. It is said to be a cube 20,000 yojanas to a side, buried deep underneath the divine (nonvisible) earth. Avīci is often translated into English as "interminable" or "incessant", referring to suffering without periods of respite, although it is believed to be ultimately impermanent. The Jingde Record of the Transmission of the Lamp, often referred to as The Transmission of the Lamp, is a 30 volume work consisting of putative biographies of the Chan patriarchs and other prominent Buddhist monks. It was produced in the Song dynasty by Shi Daoyuan. Other than the Anthology of the Patriarchal Hall, it represents the first appearance of "encounter dialogues" in the Chan tradition, which in turn are the antecedents of the famous kōan stories. Fengdu Ghost City is a large complex of shrines, temples and monasteries dedicated to the afterlife located on the Ming mountain, in Fengdu County, Chongqing municipality, China. It is situated about 170 kilometres (110 mi) downstream from Chongqing on the north bank of the Yangtze River. Youdu in Chinese mythology is the capital of Hell, or Diyu. Among the various other geographic features believed of Diyu, the capital city has been thought to be named Youdu. It is generally conceived as being similar to a typical Chinese capital city, such as Chang'an, but surrounded with and pervaded with darkness. Long is also the pinyin romanization of a Chinese surname. It includes 龍/龙, which means "dragon" in Chinese, ranking number 80 on the list of common Chinese surnames in 2006, up from 108 in 1990. Another name transcribed as Long is 隆, which is very rare in contemporary China. In Hong Kong, these names are also romanized as Lung. In Wade-Giles it is also romanized Lung. The Hall of Guru or Guru Hall, also known as the Founder's Hall, is the most important annex halls in Chinese Buddhist temples for enshrining masters of various Buddhism schools. It is encountered throughout East Asia, including in some Japanese Buddhist Kaisandos (開山堂). The Hall of Guru is generally situated to the west of the Mahavira Hall. Chan Buddhist temples usually have the Hall of Guru, which is followed by other schools' temples. Therefore three statues are always enshrined in the Guru Hall, namely the founder of the school, the senior monk who make significant contributions to the establishment of the school and the builder of the temple. Generally the Guru Hall in Chan Buddhism temples has Bodhidharma enshrined in the middle, the 6th Master Huineng's (638-713) statue on the left and Master Baizhang Huaihai's (720-814) statue on the right. Patriarch Bodhidharma and Damo for short, from south of ancient India, was the original ancestor of Chan Buddhism. The 6th Master Dajian Huineng was the actual founder of Chan Buddhism. After him, the Chan Buddhism in ancient China was almost changed and had far-reaching influence on Chinese traditional culture. Baizhang Huaihai was the third generation disciple of Huineng and his main achievements included: applying Chan Buddhism into practice, creating a set of regulations for Chan Buddhist temples and contributing to the steady development of Chan Buddhism. The Hall of Kshitigarbha or Hall of Kshitigarbha Hall is the most important annex halls in Chinese Buddhist temples and Kshitigarbha is enshrined in it. The Hall of Guanyin or Guanyin Hall is the most important annex halls in Chinese Buddhist temples and mainly for enshrining Guanyin (Avalokiteśvara). Guanyin, also called "Guanshiyin" (觀世音), "Guanshizizai" (觀世自在), "Guanzizai" (觀自在), etc., is the attendant of Amitabha and one of the "Western Three Saints" (西方三聖). Guanyin is renowned for his mercy and sympathy. According to Chapter of the Universal Gate of Avalokiteśvara Bodhisattva (《觀世音菩薩普門品》), if people are in danger, they just need to call his name and he will hear them and go to save them. Since he has many manifestations, different places enshrine different statues of Saint Guanyin (圣觀音), Guanzizai (觀自在), and Thousand-armed and eyed Guanyin (千手千眼觀音菩薩). The Shrine of Living Buddha is a Buddhist temple located at the Devine Light Summit (神光岭) of Mount Jiuhua, in Qingyang County, Anhui, China.